In the comments of a recent blog post, I received a "nomination" to participate in a blog hop! It's the four questions interview hop, which you may have seen on other blogs. I'm sorry I have no idea who started it. Lori B of Frivolous at Last nominated me and that was kinda fun, since we'd never communicated before this. How it works is easy. I'll just dive right in and answer the questions. At the end I'll nominate two more bloggers to participate. Originally, there was some sort of time frame on when the questions were to be answered, but we'll ignore that part. So here goes! I started writing this blog mostly to keep a record of the steps I take to produce a particular sewing technique. I'm a professional knit textile designer and as most textile designers do, I've kept meticulous notes and graphs so that the fabrics can be reproduced. When I decided I wanted to experiment with cutting and sewing my fabrics, I decided, of course, to keep more notes. This time I'd publish what I wrote in the form of a blog, and perhaps I'd find a community of others doing the same. This is actually my fourth blog. The first was a digital animation vlog in support of the electronic music group Silicon Soul. (I was a founding member, songwriter, and singer for the group. We had a European hit "Who Need Sleep Tonight" with a bunch of remixes and collaborations.) The second blog was about electronic (classical contemporary and dance) music and electronic art in general. I wrote to share interesting performances I'd attended, exhibits I'd viewed, or items I'd found online. 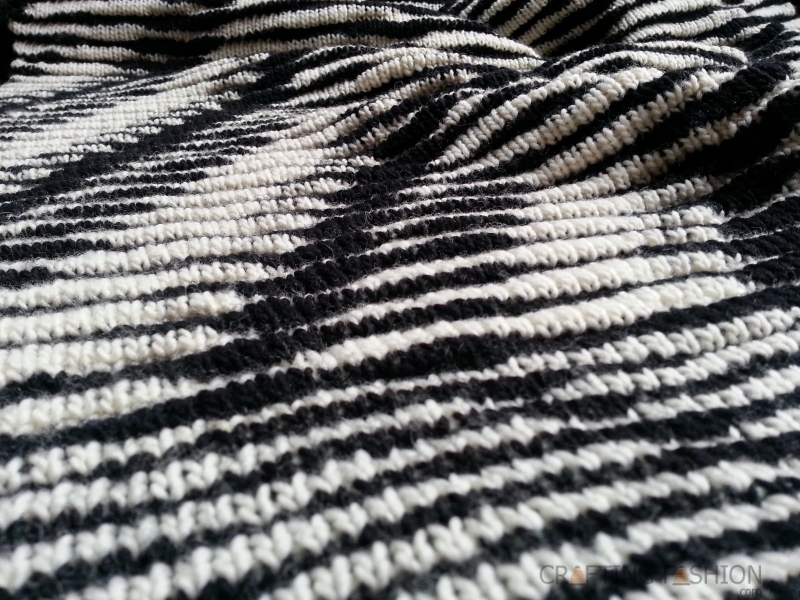 My third blog is Knitting in the Fastlane, a machine knitting blog, where I still post on an irregular basis. Though Crafting Fashion started out as just a web log, it's moved beyond that now. I try to make what I write helpful to anyone who's interested in cutting and sewing sweater knits. On occasion I'll write about the sweater knit fabrics that I design, develop and/or knit, some of which are available through my online shop. A big project that recently got underway is the Of Hand, Spirtit & Earth Studio. Jacquie Bird of SilkWire Jewelry and I have combined forces to open this studio/showroom in downtown Jersey City NJ. I'm very excited to have a place to regularly show my fabric samples, scarves, and wraps. Of Hand, Spirit & Earth is open to visitors by appointment only. Click if you'd like to know more. My very Big project (vBp) is my quest to produce a reasonably priced line of quality sweater knit fabrics. This will eventually involve getting some of my fabrics produced commercially. For those who don't knit their own, quality sweater knit fabric can be nearly impossible to find. And if you do find the fabrics, finding matching fabric, suitable for binding and bands, just doesn't happen. This quest has been a project-in-progress for a little while now, and I'm doing this because I am passionate about sweater knits. 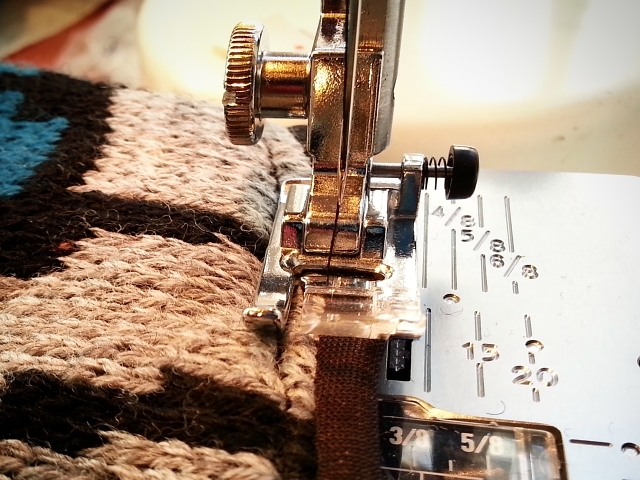 All my current custom-knit fabrics are, if not luxury, then definitely on the high end. Their widths are also limited by the width of my knitting machines. This may be fine for fashion designers who need swatches or fabric for a sample garment. It's also good for the home sewer who makes the occasional luxury item and appreciates the ease of working with the narrower fabric. I admit I'm biased, but I think more people need quality sweater knits in their lives. Ok, maybe not this much, but definitely more. The vBp will be a way to bring comfortable, quality knit fabrics to a larger audience. Once you've worked with and worn the fine grade wools, you won't be happy with the polyester and acrylic blends. If you're excited by sweater knits and my vBp and want to invest your time or money, let's talk. 3. How does my blog differ from others in its genre? Do you remember how I said "perhaps I'd find a community of others who were doing the same"? Well, that never happened. No other bloggers specialize in cutting and sewing sweater knits. At least there aren't any sewers that I've come across who do. There may be machine knitters who blog on this.... If you're out there, please let me know! Anyway, I hope that people who are interested in cutting and sewing sweater knits have found my experiments and posts helpful. Working with this type of knit is quite different from working with lighter weight and finer gauged knits. This blog doesn't have lots of subscribers, but according to Google Analytics, some of my posts (the tutorials and tips) have lifetime pageviews hundreds of times my average?! 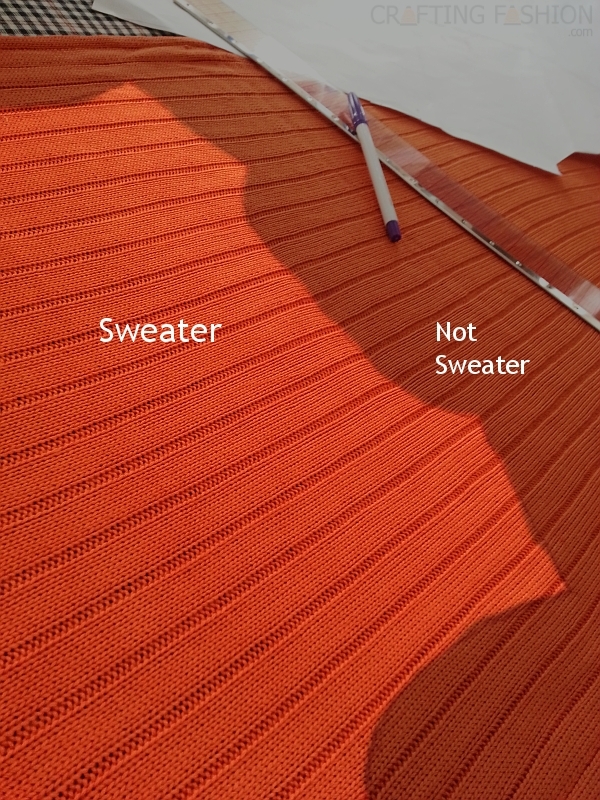 Most readers, who get here via Google, search "how to cut and sew a sweater" or similar query. My writing process is project-driven. I write about the personal projects that I'm working on or about what I've recently completed, trying to document at least the broader strokes. I don't write about projects I do for private clients, unless the fabric I'm knitting is commercially available in my shop. For this blog, my topics have to do with cutting and sewing the fabrics; usually Crafting Fashion is not about making the fabrics. The pictures, which aren't always as great as I'd like, can come before I start the writing, while I'm writing, or after I've finished the writing. I don't really enjoy taking my own picture modeling a finished garment, but I force myself to do it. I love taking project-in-progress pictures, because they often serve as a writing prompt. I find pics helpful when I'm trying to recreate something I've done previously. I'm glad that others have told me the pics are helpful, too. I've learned to enjoy taking pictures of provocatively draped knit fabrics and then describing them, but I've decided that long winded, detailed descriptions of sweater knits are beyond the scope of this blog! I'd really love to have an editor. Now is my turn to nominate two bloggers to answer the four questions. My first nomination is Esther Melander of The Design Loft. I've never met Esther and not sure I've ever left a comment on her blog, but I enjoy reading what she writes because it's often technical and meaty. She has worked in the fashion industry and has written a book called The Organized Fashion Designer. Though I'm doing much more textile designing than fashion designing these days, I'm thinking that her book of guides and forms might be helpful as I proceed with my vBp. It would be interesting to learn about her writing process. I also nominate Chuleenan Svetvilas of C Sews. I follow Chuleenan on the various social media and we've commented on each other's blogs, though we've never met in person. I love the dresses she makes and the hats she wears. I admire her sense of style and I'd love to hear about her creative process. I hope Esther and Chuleenan accept the nominations. I bet you have more followers than you think (I follow through Feedly reader and it says there are 36 others following there). Most followers of any blog are the silent, non-commenting type. I have dreams of making a sweater dress someday since I've never found the right style/color/fit in stores. And when I finally decide on specific style and color, I will most likely be getting some custom knit fabric from you because your fabrics are beautiful! I look forward to your vBp too - coordinating fabrics would be wonderful! I hope you do get around to sewing a sweater dress one day! Thank you. It would be lovely creating a fabric for you. It was great to read more about you and your blog and your other projects! Yours indeed is the only blog dedicated to sewing sweater knits. And I'm glad I found you. I bought a couple yards of sweater knit fabric some months and have just now gotten around to wrapping my mind around making something with it. I'm a quilter and the thought of cutting into what feels like rather flimsy sweater knit fabric frightens me. I've been on your blog everyday for the past week and thanks to your tutorials on seams, finishes, and bindings I'm gonna take the plunge and start tonight working on either a kimono (ambitious), or slouchy sweater (more in my skill set) or simply a shawl (makes better sense as a first sweater knit project). Thanks and keep posting. A new person cutting and sewing sweater knits! Yay! My advice, if you're a little frightened, would be to start with something easy and build your skills from there. Confidence well come sooner than you think. Enjoy! I hope you enjoy answering the questions. I look forward to reading your answers. Good to meet you, deuxsouriceaux! An SK840, nice! Since you have a serger and machine knit, (and have the yarn) another finish that might interest you is using yarn in the loopers. It takes a bit of tension adjustment but looks more finished that a regular serged edge. All the best!